Now that we have started Mardi Gras in town, it’s a reminder that Easter is just around the corner. I know some of you are going NOOOOOOOOOOOOOOOOOO, but it’s true. Plus by the time Easter gets here, its spring, so there is that. Yesterday I hopped (see what I did there?) over to the craft store to see if I could find something holiday related to do with the kids. Turns out, I found something holiday related I could do with the kids AND the cats, so torture it is! 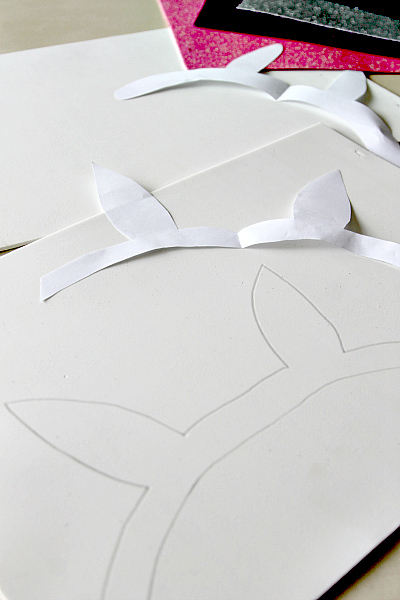 To start you need to make yourself a bunny ear template or printable. I folded a piece of paper in half and drew a half circle out, then the bunny ear (honestly I am not good that that) and then another half circle out. That is the piece that goes around the head so depending on who you are fitting, you can make this shorter or longer. I would honestly put mine here but it was pretty lame so I am sure its a better idea for you to draw out your own till you get it just right. Bunny ears have a slight point at the top but if you make it too pointy its gonna be more like an elf. Once you have your template cut it out and unfold. You should have two perfect halves. My first few attempts looked a little more like Legolas than the Easter Bunny…which is why you practice on printer paper and not your foam. Now trace your template onto the foam with a pencil and cut out. Foam is very easy to cut, but it will pick up EVERY little imperfection so if you are good at an exact-o knife, you might want to go that route vs scissors. Once you have your ears you just need to cut a few pieces for the inside. I used pink, but feel free to use any color you want! Use a small glue dot to secure the pink insides of the ears. Now grab your hole punch and punch out on each end of your ears. Tie a piece of elastic from one side to the other, knotting at the ends. The length of this will depend on the person you are fitting. Do not make it too tight! At first my elastic was a little too long. But eventually I got it just right….and annoyed the cats. Remember to never leave kids or animals unattended with elastic! As you can see I used my elastic around the back of their head and not under the neck. You can use this same technique to make princess crowns, Mickey Mouse Ears, Elf ears and more! I hope you enjoy! Do you love Easter crafting as much as we do? Love these! Now if I can just get my little guy to keep them on for a picture. Thanks for sharing on the weekend re-Treat link party. Hope you link up to the party again tomorrow! Too cute! Love the look on the cat lol! Hope you visit our Snickerdoodle Sunday sometime! Oh my goodness, how cute! P is just too cute in the last picture. Love them! Your cat looks absolutely delighted with the thing he is wearing on his head. Last Christmas I wanted to put a Santa`s hat on my cat in order to take photo but he refused to do it. It was such a funny moment! Oh my goodness! That last pic is to die for! Aww, who wouldn’t want such adorable bunnies hopping around — so cute! Even your cat looks like its (kinda) enjoying the new look! Adorable bunny ears. Glad to hear I can use this technique to make Mickey Mouse ears. My daughter became a Disney fan overnight. What a cute idea! My cat would go nuts if I tried to put something on her head. Yours looks happy and content with the ears. I love the first pictures! Amazing! Awesome! My cat would have been SOOO mad. Too adorable! Pinning! Those are super simple and cute. I could have my boys make these with just a little supervision. I think P really likes them, check out his adorable smile. OH! I can’t WAIT to torture, um, play with my cats and make them ears. So easy and fun! Love the sparkly pink inner ear part, my girls would totally wear these! Supercute, but I’m still not convinced I can get Geronimo to play along. Seems super easy to make!! P is so handsome in his bunny ears! Love the last picture of P!